Most people are familiar with the concept of fish eggs or roe, but not necessarily as food. Not everyone knows you can actually eat fish eggs or how you can eat them other than in caviar form. Even more important, not everyone is aware of the wonderful nutritional value and health benefits of fish eggs. High in Omega-3 but also high in cholesterol, vitamins D and B12, sodium, fat and protein, they are just that good for you and it’s a fact. Regular consumption contributes to varied health benefits, making fish eggs as much of a nutritionally dense food as regular chicken, duck, goose, quail and other poultry eggs. Simply put, fish eggs are the eggs of female fish. Another name for fish eggs is roe. They are a type of seafood, although they are technically eggs too. They are typically eaten either raw or cooked. When eaten raw, they retain the most of their nutritional properties as well as offer an exquisite taste experience. Cooking or pasteurization has its benefits too, mainly removing Salmonella, Listeria or Vibrio bacteria in the eggs which can be sources of infection and gastrointestinal disease. Some types of fish roe are more expensive than others, depending on the species of fish they are sourced from. Sturgeon eggs, the source of authentic black caviar, are the most expensive fish eggs, more than salmon eggs, for example, which are the main source of the more affordable red caviar. What is the difference between caviar and fish eggs or roe? While all caviar is fish eggs, not all fish eggs are caviar (only sturgeon roe). By definition, authentic, traditional black caviar is from sturgeon alone so only sturgeon eggs are used for caviar. Other than this, caviar is simply lightly salted fish eggs. What do fish eggs look like? Fish eggs are round, soft, gelatinous in consistency, but firm. They are glossy and translucent. They can be smaller like in the case of sturgeon eggs used for black caviar or larger, the size of peas, like salmon eggs used for red caviar. The color of the eggs varies between species and within the same species of fish. Some eggs are one solid color such as grey, black or red, others have interesting yellow, golden, reddish or olive undertones. Sturgeon eggs are typically darker grey to black, hence the reason why all caviar is black (true caviar is made only from sturgeon eggs). Salmon eggs are bright red, red-orange. Typically, the younger the fish, the more intense the color of the eggs. Older sturgeon can produce lighter-colored eggs resulting in rare, but expensive black caviar varieties that are not really black such as silver and golden caviar. Some sturgeon eggs are grey-brown, reddish-brown or a golden brown with olive undertones such as Ossetra. Some fish eggs such as lumpfish are dyed either red or black and passed off as red and black caviar. Species related to salmon can have yellow, pink, orange and red roe. What do fish eggs taste like? In the right preparations, all fish eggs taste great, not just the more expensive black caviar. Factors that influence taste include the species of fish the eggs are sourced from, age of the fish and processing undergone. Overall, the eggs should taste only mildly fishy and have a pleasant briny savor reminiscent of the sea. Some of the highest quality fish roe products, caviar included, are either fresh or pasteurized, but only lightly salted. 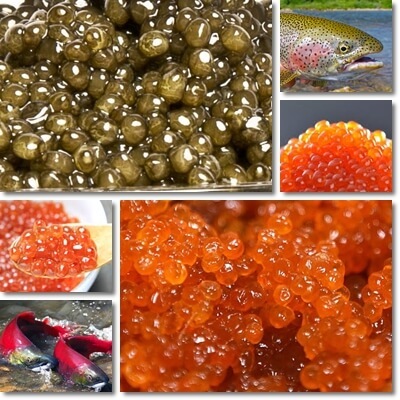 At the same time, there are also fish roe products that are processed to higher degrees, whether this means they are dyed to resemble the higher quality caviar products or have flavor additives, spices or various condiments. Processing usually affects taste, moreso if it’s excessive. Fish roe in general is really somewhat of an acquired taste. The natural make-up and particular consistency of the eggs give them a popping property which most people find adds points to the taste experience. However, the sometimes unappealing colors like lighter grey or gold with olive undertones and the mild fishy taste may deter some people from even giving them a try in the first place. However, if what you are eating is extremely salted, smells funny, off or overly fishy or does not inspire freshness, then it might be because the roe has either gone bad or is not a quality product. If you were wondering how exactly is fish roe good for health, then know it’s all about the nutritional value. Generally speaking, fish eggs are high-protein, high-fat, high in cholesterol and Omega-3, high in vitamins D and B12, but also selenium and good sources of vitamins A and E, zinc, iron, magnesium and most B vitamins. Because of the way they are usually prepared, they are also high-sodium. Of course, there are some differences in nutrition facts between the eggs of different species of fish and sometimes also between eggs sourced from the same species but these differences are minor. Unless you are allergic to fish, you can eat fish eggs and enjoy the benefits they have to offer. Because fish eggs are good for you even in the small amounts they are meant to be eaten. As they are high in fat, especially healthy Omega-3 fatty acids, they are good for brain and nervous system health, support memory and learning, reduce brain fog and protect nerve cells. The healthy Omega-3 fatty acids in the eggs also have anti-inflammatory properties with benefits for the cardiovascular system. Cholesterol together with vitamin B12 protect the myelin sheath surrounding the tail of nerve cells. Cholesterol further helps the body make hormones and process vitamin D. Both cholesterol and vitamin D hold benefits for fertility. Vitamin D and zinc make fish eggs an immune system-boosting food. Selenium and iodine regulate thyroid activity with benefits for fertility and metabolism, among others. The generous amounts of vitamin B12 and iron in fish eggs combat fatigue and anemia, restoring vitality. Small amounts of magnesium and potassium help lower high blood pressure numbers. But only if the fish eggs are unsalted are they good for high blood pressure. Vitamins A, E, the range of of B vitamins and all the fats from Omega-3 to cholesterol to saturated fat are good for skin health. Salmon roe and essentially all fish eggs that are naturally bright red, orange or pink contain antioxidant pigments that are good for eyesight. You can also eat unsalted or lightly salted roe if you have diabetes type 2. High in protein and fat and low in carbs, fish roe has almost no visible effect on blood sugar when eaten on its own. You can eat fish eggs during pregnancy, but it’s advised to choose pasteurized, preferably lightly salted or unsalted options. There is a risk of Vibrio, Salmonella and Listeria in fish eggs that have not been pasteurized and these bacteria can prove particularly dangerous for pregnant women in particular. Intestinal parasites in raw fish eggs are another concern, especially for pregnant women or other high risk categories such as children, the elderly or immunodeficient individuals. On this note, it’s never good to feed unpasteurized fish roe to babies or small children mainly because of the risks posed by intestinal parasites and bacteria such as Vibrio, Salmonella or Listeria. The potential for bacterial or parasitic infections aside, eating (pasteurized) fish roe during pregnancy is not such as bad choice and can provide more benefits than side effects. The high amounts of vitamin B12 help support the expanding circulatory system of the mother as well benefit the baby by contributing to the normal development of its nervous system. Iron and other B vitamins help combat tiredness, up energy levels and restore vitality. Healthy Omega-3 fatty acids EPA and DHA help with brain development of the baby in the womb and possibly also hold benefits for mental health for the mother-to-be. 1) Avoid raw eggs in all forms. Choose pasteurized or thoroughly cooked egg products. 2) Refrigerate all egg products after opening. In the case of fish roe, store in the coldest part of the refrigerator. 3) Do not let linger at room temperature for more than a few minutes. Put the jar, tin or other container back in the refrigerator as soon as possible. 4) Do not eat if it smells bad or the taste is off. 5) Do no eat past expiration date. 6) Choose a quality product, even if it’s more expensive.